Some of the shops where the conversions were done may have gone out of business, as well as few manufacturers, thus voiding their parts and labor warranties. 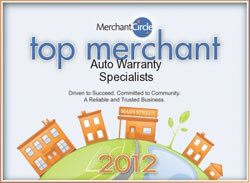 Many Alt Fuel owners may have signed away all of their vehicle warranty rights at the dealer level. Specialty programs, underwritten by one of our primary carriers, will cover Alt Fuel Conversion Units "ONLY" while your 4X4 is still under the original factory warranty period ( the first 3 years or 36000 miles of your odometer reading ). Once the factory warranty has elapsed, our Extended Service Program will cover the complete vehicle and Conversion Unit out to its selected time frame or mileage, as outlined in the purchase contract. The Conversion Unit of the 4X4 must be inspected by one of our recommended Alt Fuel shops. Upon completion of the inspection, if there are any repairs or adjustments necessary to gualify for coverage, you the customer are responsible for any charges that may apply. Coverage can then be incepted. If you are not using the Alt Fuel Conversion portion of your 4X4, you may exclude the conversion and cover the rest of your vehicle. Please call for more details. The demand for transportation fuels in the USA is increasing. The number of light-duty vehicles in California alone is projected to grow from 25.6 million on-road vehicles in 2003 to 35.6 million by 2025. Unless we change our habits, petroleum will be the primary source of the USA's transportation fuels for the foreseeable future, and as demand continues to rise and in-state and Alaskan petroleum supplies diminish, the USA will rely more and more on foreign imports of crude oil. Nearly 100 percent of our transportation system is currently fueled by fossil fuels. Moving toward a more diversified range of fuels and supporting the advancement of higher efficiency vehicles are two of the goals of Alternative Fuel Vehicle programs. Many states have supported the development of alternative transportation fuels (fuels other than gasoline or diesel) since the creation of the the USA Energy Commission in 1975. Earlier programs included demonstration programs with vehicles using ethanol and methanol, infrastructure development for methanol/gasoline blends, support for flexible fuel, natural gas, and electric vehicles. "Increase the use of non-petroleum fuels to 20 percent of on-road fuel consumption by 2020 and 30 percent by 2030, based on identified strategies that are achievable and cost-beneficial." The USA is already home to a growing number of alternative fuel vehicles through the joint efforts of the Energy Commission, Air Resources Board, local air districts, federal government, transit agencies, utilities, and other public and private entities. More than 61,000 cars, transit buses, and trucks currently operate on natural gas and LPG, along with more than 10,000 electric vehicles. the USA also has hundreds of fueling stations dispensing a variety of non-petroleum fuels. Increasing the use of these fuels, however, faces significant uncertainties such as the availability of new vehicle technologies, the cost and availability of new fueling infrastructures, and acceptance of these fuels by consumers. Currently, the Energy Commission is working with stakeholders of various alternative fuels. These stakeholder working groups have participated in informal surveys to identify the principal barriers that exist to developing a more robust alternative fuels market in the USA and to develop recommendations for overcoming or mitigating those barriers.